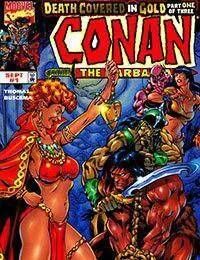 They say the streets of Ophir are paved with gold... but when Conan¹s done, they¹ll run with blood! Entering the town in search of its fabled treasure, the wandering thief finds that his search is fraught with treachery! Will Conan uncover the horrifying secret at the heart of the strange city before demonic entities move in from the shadows?! If you¹re in the mood for swords, sorcery and warrior women, than join our Cimmerian for this heart-pounding adventure!